Outcroppings of limestone at Viosca Knoll provide hard substrate fordeep-sea corals and anemones and habitat for rich communities of fish,crustaceans and echinoderms. Click image for larger view. 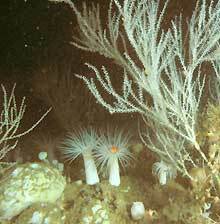 One of the mission objectives for NOAA’s Office of Ocean Exploration is the characterization of benthic (bottom) and pelagic (water column) habitats and ecosystems.This has proven to be a great challenge in the deep-sea environment, as many of the large predators flee from noisy, brightly lit submersibles. In addition to the temporary disruption of normal behavior, animals with photoreceptors designed for the dimly lit deep-sea environment may be permanently blinded by the very lights we use to find them. Looking at the deep-sea through human eyes may also have affected description of animal interactions, since animals that may be transparent, and therefore virtually invisible to humans under bright submersible lights, may be much more visible to animals with polarization and/or UV sensitivity. Operation Deep-Scope 2004 looked into the deep ocean with new eyes and made an astonishing array of discoveries in a very short time, including the discovery of a fluorescent shark, the fluorescence of methane hydrates, and the discovery of a new species of large deep-sea squid. Operation Deep-Scope 2005 brings together the same international team of scientists, utilizing even more methods of seeing and collecting. Using advanced technology, we will continue to study these hidden depths, deploying the unobstrusive Eye in the Sea camera for 24 hours, using a variety of cameras and filters during dives with the Johnson-Sea-Link submersible to study polarization and fluorescence in the deep-sea environment, and utilizing new collection techniques to collect live deep-sea species for study in shipboard labs. September 4, 2005 In the mission summary, Edith Widder reflects on the need to protect this magnificent underwater frontier and its amazing secrets. September 3, 2005 Experience a blue water dive and watch a beautiful transparent jellyfish float near the surface. September 2, 2005 A visual feeding frenzy occurs as the scientists gather to watch the images from the Eye-in-the-Sea (EITS) camera. September 1, 2005 The Captain of the R/V Seward Johnson discusses the challenges of navigation in the wake of Katrina. August 31, 2005 Find out what it's like to be an Ocean Engineer on a NOAA expedition. August 30, 2005 So what do you do at sea when you're not "at sea"? You analyze data. August 29, 2005 Despite Hurricane Katrina and mechanical problems, we still managed a dive and brought up a crab possessing an unusual amount of ultraviolet sensitivity. August 28, 2005 The R/V Seward Johnson shelters in Galveston as Hurricane Katrina bears down upon New Orleans. August 27, 2005 While the approach of Hurricane Katrina forces us to leave port, research on light-responsiveness in eyeless animals continues. August 26, 2005 Temporarily without the sub, we've continued our research by netting a catch of zooplankton and copepods. August 25, 2005 As our submersible plunges beneath the waves, a team of technicians gathers data on the state of our ocean planet. August 24, 2005 Halfway through the expedition and we've found fluorescent creatures from the surface all the way to depths of 1,800 feet. August 23, 2005 It's not every day that an eight foot long six-gill shark brushes the top of your submersible. August 22, 2005 Like a scene from "The Life Aquatic," the crew films a flourescent chain cat shark a few inches off the ocean floor. August 21, 2005 Cancer crabs complicate the first sub dive of the expedition. Time for Plan C! August 20, 2005 Operation Deep Scope 2005 gets off to a fast start as it delves into the ocean depths in search of new discoveries.